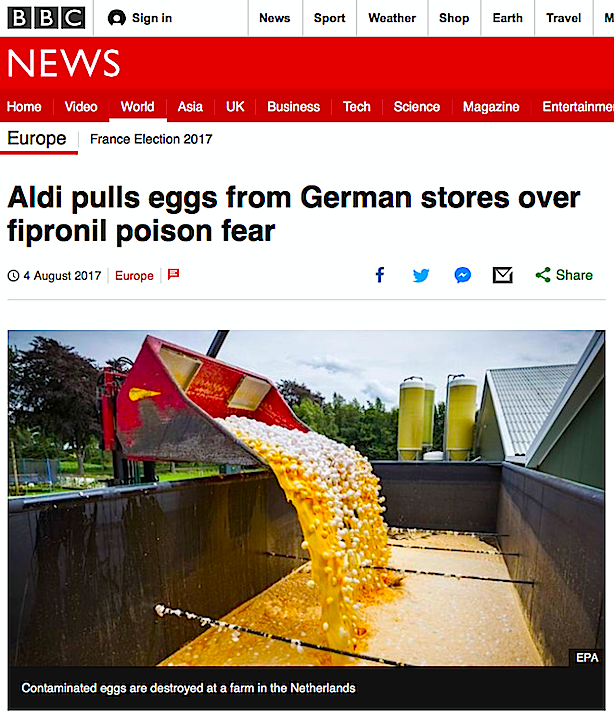 Fluoridation Queensland | Aldi – 4,000 stores in Germany – stop selling all eggs as a precaution. Aldi – 4,000 stores in Germany – stop selling all eggs as a precaution. Germany as they may have been contaminated by insecticide. Tests showed that the chemical fipronil, which can harm people’s kidneys, liver and thyroid glands, was found in eggs from the Netherlands. One German official said up to 10 million of the contaminated eggs may have been sold in Germany. Christian Meyer, the agriculture minister for Lower Saxony, told German television that there was a risk to children if they ate two of the eggs a day. About 180 poultry farms in the Netherlands have been temporarily shut in recent days while investigations are held. Marieke van der Molen, of the Dutch public prosecutor’s office, said a criminal investigation was under way to find the source of the contamination. Meanwhile, European supermarkets have moved to halt the distribution of eggs from the affected batches. However, Aldi – which has close to 4,000 stores in Germany – is the first retailer to stop selling all eggs as a precaution. “This is merely a precaution, there is no reason to assume there are any health risks,” Aldi said in a statement. A spokeswoman for Aldi UK told the BBC its eggs were all British and were not affected by the contamination. Reuters reports that investigators believe the chemical may have originated in contaminated detergent used to clean barns. Poultry World reported that fipronil may have been deliberately added to an existing insecticide to improve its effectiveness. The Netherlands is Europe’s largest exporter of eggs and egg products, and one of the biggest in the world. It exports an estimated 65% of the 10 billion eggs it produces every year.